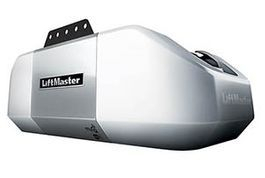 Feel free to browse our inventory of LiftMaster Brand Garage Door Openers. Whether you are looking for the basic opener or something more sophisticated. Battery back-up units, cell phone and computer compatible units. Screw drive, 3/4hp chain drive, 1/2hp belt drive and jack shaft operators are all available at your local dealer. Fast, friendly service. Quality parts that last. Awesome prices! Experienced technicians take the extra time to make sure your new product is operating correctly and that you are fully satisfied with your new unit. ASK US ABOUT PRICE MATCHING. Looking for a great gift? Need to update your unit? 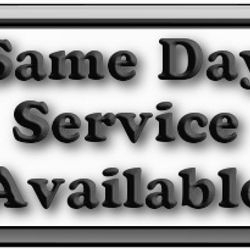 Premium garage door openers ON SALE NOW! LM-8550W - DC Battery Backup Belt Drive Wi-Fi Garage Door Opener. 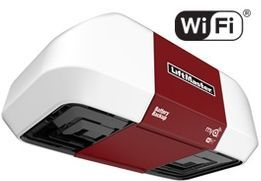 The LiftMaster 8550 has improved with built in Wi-Fi. P3 motor for power and durability. DC motor belt system for quiet performance. 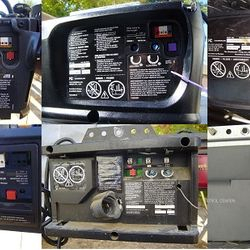 Battery backup, Lifetime warranty on belt and motor. 5 years on parts. 1 year battery & accessories warranty. Includes smart control panel model 880LM for easy programming. LCD display and menu enable simple adjustment of settings. Security+ 2.0 & infra red eyes for safety. Posi-Lock system, alert to close, and motion sensor. Additional keyless entry and ad on available for ease of access usability. 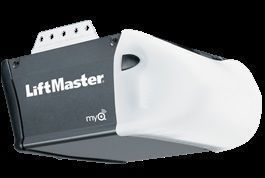 LM-8587W - LiftMaster 3/4hp AC Chain Drive MyQ technology now with Wi-Fi. P3 Motor with chain drive is built to provide maximum power to lift the heaviest doors including carriage house and solid wood. I-beam rail system and reinforced chassis. Motor vibration Isolation system. PosiLock. Timer-to-close. Motion detector. 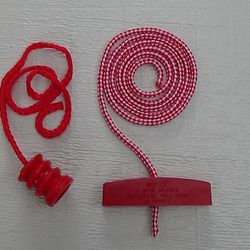 Safety sensors. Security+ 2.0. Energy efficient. Lifetime motor and 5-year parts warranty…. 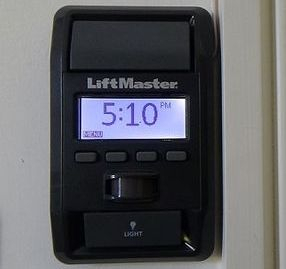 control of your garage door opener with a smartphone, tablet or laptop. 3/4hp AC motor belt drive system combines a strong pulling force with a steel reinforced belt to lift heavy doors while delivering power, ultra quiet performance. P3 motors provide proven reliability and durability. Dependable warranty includes lifetime coverage of motor and 5 years on parts. 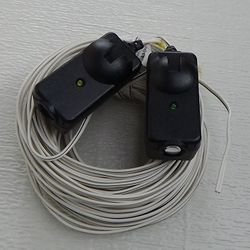 Security+ 2.0 timer to close, alert to close warning system, motion detector, safety sensors emit an invisible light beam across the garage opening automatically reversing the door if an object interrupts the beam. 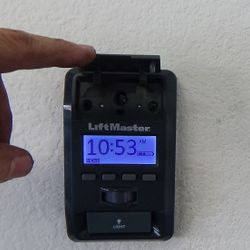 LM-8500 - Wall Mount Garage Door Opener Exclusive wall mount design offers a cleaner appearance, freeing the garage ceiling of hanging operator, rail. Design allows for installation in garages with cathedral or obstructed ceilings. MyQ control panel. Timer-to-close feature. Motion detecting feature. Security+ 2.0 virtually eliminates interference. 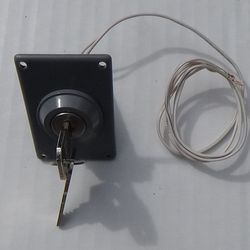 Power Lock deadbolt. The remote light lets you light your garage wherever it is needed. Additional remote lights available. LM-8360 - DC Battery Backup Capable Chain Drive, Secure and Reliable. Get in your garage every time, even when the power is out. Energy Efficient. Industrial strength chain drive system provides steady performance and lifting power. Lifetime motor warranty. Safety sensors. Security+ 2.0. Battery backup. MyQ Motion Detecting Control Panel. Alert-2-close. PosiLock System. 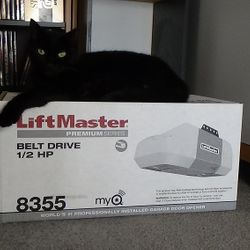 LM-8355 - LiftMaster 1/2hp AC Belt Drive Smart, Quiet and Energy Efficient. MyQ technology. P3 Motor with belt drive system provides quiet, reliable and maintenance free performance. Motor Vibration Isolation System. Lifetime motor and belt warranty. Security+ 2.0. PosiLock System. Safety sensors. Multi-function control panel. Alert-2-close. 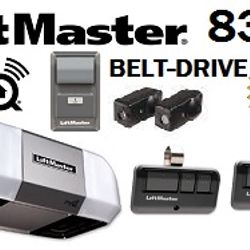 LM-8355W - LiftMaster 1/2hp Belt Drive Now With Built In Wi-Fi. NEW PRODUCT! 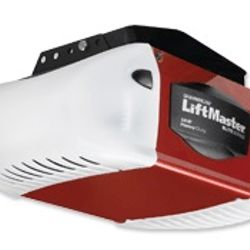 LM-3240 - LiftMaster 1/2hp Screw Drive Smooth running, Even in the most extreme temperatures. With a completely maintenance free drive system. One piece steel rail. No lubrication required. Motor Vibration Isolation System for smooth operation. Lifetime motor warranty. Multi-Function Control Panel. Security+ with rolling code technology. Safety sensors. PosiLock System. 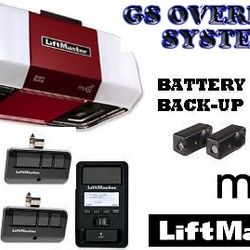 LM-8365W - LiftMaster 1/2hp AC Chain Drive MyQ technology. P3 Motor by LiftMaster with posi-lock system..Energy efficient Lifetime warranty on motor. Security+2.0 remotes, alert to close, protector system safety cameras with the 882LM multi-function wall console. This unit is rugged, reliable with powerful performance. Now with Wi-Fi. On Sale... for a limited time. Call for details. Dependable Performance, Energy Efficient P3 Motor with 4 Year Warranty. 10 years on Belt & 1 Year Parts. 891LM Remote, 882LM Multi-Function Control Panel, Protector System Safety Sensors. Auto Force Adjustment & Electronic Limit Settings. Travel Rate = 7" /second.